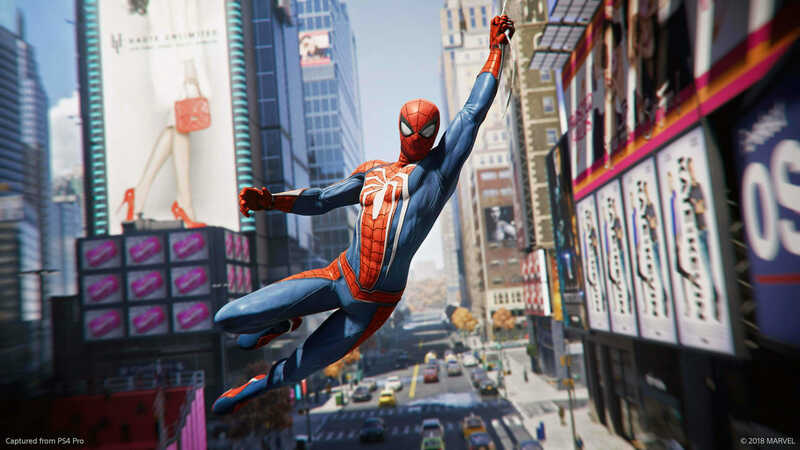 Everyone’s favorite wall-crawler has returned to gracefully swing through NY city, beat down the bad guys, and make eye-rolling puns in the latest superhero action game, Marvel Spider-Man. Insomniac Games has a great track record, so I knew this franchise was in good hands the moment the game was announced. However, I didn’t expect to actually feel as nimble and powerful as a giant spider when playing it! Web-slinger wannabes begin their high-flying adventure as Peter Parker, who has already been Spider-Man for years (no need for yet another origin story, so thanks Insomniac writers!). His relationship with Mary Jane Watson is estranged, but things are warming back up. Meanwhile, a new enemy is introduced, and players are tasked with stopping his mayhem and taking him down while also undertaking optional missions and side tasks. Just when the villain is defeated and the story seems to be winding down, it takes a bold new turn and follows a completely different path. I really appreciate this unexpected turn of events, as well as the introduction of Miles Morales. Fans of the Spider-Man comics will know where this is going, and newcomers will be able to figure it out by the end of the game (makes sure to…ahem…stick around for the post-credit scene). Let’s begin with one of my favorite aspects of the game, which is the wonderfully-intuitive web-swinging. I’ve played every Spider-Man game released on consoles, and the web-based traversal mechanic in Marvel Spider-Man is heads and shoulders above the rest! The natural fluidity of swinging through the city, releasing the web, doing a graceful backflip, and then either continuing forward with another web swing or zipping to the side to change course is simply unsurpassed! Another option is to land on the side of a building and then either run sideways and jump off into another web-swing or run up the building and launch off the top to continue forward. Even more realism is added by the requirement of a taller building (or trees) to attach the web to when swinging. Try to web-swing with nothing to attach to, and spider-man will drop like an insect in a bug zapper. Unlike some past games, there’s no magical swinging through open areas. I suggest upgrading web-swinging skills early as they will be used for the entire game. Speaking of skills, there are three skill trees to choose from: Innovator, Defender, and Webslinger. Each skill tree branches out, with several skills that include both active and passive abilities that enhance stealth, combat, web-slinging, and web-swinging abilities. I found the web throw skill line to be very useful early on, and tossing enemies into each other or sticking them to the wall never gets old. It’s also good to concentrate on the Focus-enhancing abilities early on as they lead to an increased frequency of self-heals and/or instant takedowns. There’s little concern about choosing the wrong skill because most are earned by the halfway point of the game if players also complete side missions. This may sound cool, but it actually stifled some of my desire to progress as I felt that I had reached my zenith well before the end of the game. In addition, the final skills in each tree seem rather lackluster to me. While they can be useful, I wasn’t excited to earn any of them. Even the ability to grab grenades and rockets with Spider-Man’s web and toss them back at enemies isn’t as thrilling as it should be. Fortunately, the combat itself is fun and exciting. The transition between web combat, ground combat, and air combat is super-smooth, which creates an overall fluidity that is both intuitive and adaptable. I love how so many different types of moves can be combined to create new combos. For example, one of my favorite combos when fighting on rooftops is to launch enemies into the air, smack them around a bit, and then use the swing kick to knock them over the side for an instant takedown. It’s also great fun to combine ground combat with air combat and see how many enemies can be defeated before Spidey touches the ground. Adding gadgets to the mix opens up even more combat abilities! The web-slinger’s default gadget shoots basic webs that can tangle enemies and attach them to walls, but advanced weapons can activate a drone, set a web trip mine, and even create a sonic blast that sends enemies flying. Most of these gadgets are ideal for stealth, but they can also be used in the heat of battle. It’s also possible to switch between gadgets during combat so they can be combined in different ways. One rare example is shooting a trip mine on an approaching enemy and then switching to the sonic blast to knock him into the air only to have the trip mine attach itself to the top of a lampost and web the enemy up in a neat and tidy bundle high above the ground. While I love the combat, I find the combo counter to be too forgiving. One miss ends a combo in other games with similar combat systems, but missing an enemy more then once doesn’t end the combo in Marvel Spider-Man. This makes it too easy to rack up 30+ combos during practically every battle, and high combos increase the Focus bar faster, which leads to more instant takedowns and/or self-heals. Only the heavily-armored enemies sporting advanced gear such as laser lassos and jetpacks provide much of a challenge. Most gadgets don’t work on them, and they can block most of Spidey’s attacks, so players have to combine dodges and attacks to take them down. Regardless of these few gripes, Marvel Spider-Man is a fantastic homage to the the source material and to the Marvel Universe. I’m really looking forward to the inevitable sequel/s. To help keep players interested, a campaign called The City that Never Sleeps is being offered in three DLC packs. The Heist and Turf Wars have already released, and Silver Lining is dropping in December. Favorite PS4 game. Actually, favorite super hero game.